DIY robot kits for adults are becoming pretty popular and it’s not hard to see why. They are a great way to develop a whole bunch of skills including mechanical & electrical engineering, design and coding. But its not all fun and games, these skills can have actual value that be transferred to the workplace. As automation replaces jobs in many sectors, work in STEM fields is on the rise. Therefore, what you can learn by experimenting with these robotics sets could open you up to new job opportunities in the future. What Factors Influenced Our Choice? Unfortunately, there are a lot of robotics kits on the market which suffer from poor hardware, poor instructions/support or low quality software – sometimes all three! If you are new to robotics these features are critical to a good learning experience. As such, these were major factors influencing our choice of products. Another major consideration was whether the kit was suitable for both beginner and advanced programmers. We think good robotics sets should feature a simple drag-and-drop icon based programming interface to get started or for those more interested in the engineering side of things. However, the kits should also support complex coding languages like Python and other C languages. The final factor was the activeness of the community and the quality of online resources available to users. Based on the above criteria we have recommended the best DIY robot kits for adults in 2018. Best for Learning: Mechanical Engineering, Coding, Design. Lego Mindstorms is one of the most popular robotics kit for adults on the market. 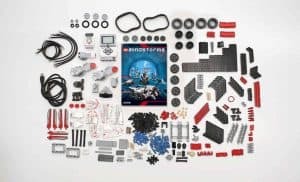 With Mindstorms, Lego have combined a familiar construction toy with new programming elements, motors and sensors to create something truly astonishing. 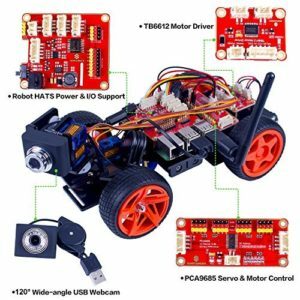 The high spec hardware includes 550 elements, EV3 programmer brick with powerful ARM9 processor, 3 servo motors plus color, touch and infrared sensors. Lego provide instructions for 5 builds including the classic humanoid robot, a cobra and an awesome all-terrain tank. You also have access to instructions for another 12 cool fan made robots on the website. However, it’s up to you to experiment and see where your creativity takes you. 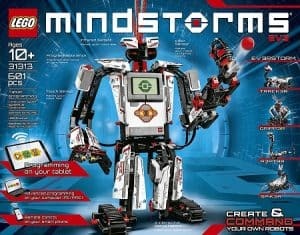 The best part is that Mindstorms is compatible with normal Lego bricks so you can really let your imagination run wild! If you are new to coding the simple drag-and-drop format in the Programmer App is great for beginners. All you have to do is move graphical blocks representing different commands into your desired sequence, then send your code to the robot. You can also download the more advanced programming software for PC or Mac if you want to take things a bit further. However, the icon based format has its limitations as there are no debugging tools and long sequences can become inefficient. So, if you want to create more complex commands, you will need to install a text-based programming language. You can find an overview of some options here, but we recommend ROBOTC as it is dynamic, flexible and easy to use. It will require you to update your EV3’s firmware which is easily done following the getting started guide. ROBOTC also provide an extensive user guide which features a handy command library. The main benefit of using a text based language like ROBOTC is that it is based on the industry standard C-language, so you are developing transferable skills. Often with robotics kits what holds them back is a lack of a decent support system for when you run into issues. However, the online Mindstorms community is massive and very active so you can get advice when you need it check it out on Reddit. Furthermore, you can also get in contact with the support team and chat with one of the experts. Another issue with some cheaper sets on the market is poor/missing instructions. Lego on the other hand have been selling complex models for years so you know you can rely on well formed, detailed guides for all their builds. These reasons are why we recommend Mindstorms as the best build your own robot kit for adults in 2018. The only downside here is that it is quite expensive relative to some other kits! The second recommended set on our list of the best DIY robot kits for adults is the Hexbug Vex IQ. This is a good alternative to Mindstorms if you are looking for a more budget option. 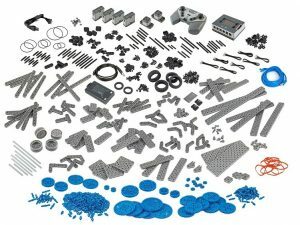 However, it’s still packed with 750+ high quality components with some awesome robotics technology and we think it just as good as Mindstorms. The robots are all centered around the Vex IQ robot brain – an advanced piece of robotics hardware featuring an LCD screen for easy operation and 12 ‘smart ports’. Each of these ports can be configured with ‘smart motors’, sensors or other devices when programming your robots. But it doesn’t stop there! The motors themselves contain their own processor, quadracore encoder and current monitor giving them incredible functionality and precision. This also allows you to get data and feedback to improve performance. Additionally, the color, bumper switch and touch LED sensors allow you to customize how your robot interacts with its environment. In terms of value for money, we think Vex are one of the best. After you are done building you can control basic functions with a remote or customize your robots via two programming options. The first is with a modular, drag-and-drop interface called Modkit available on PC, Mac or iPad App. This is super simple and easy to learn, you basically just drop graphical blocks of code into sequences and download them to your robot’s brain. However, if you are having trouble Vex have several video tutorials to help get the basics down. The second option is with ROBOTC. This is an advanced coding software which allows you to program your robots to do far more complex things. That said, the editor has several features to aid beginners. These include a live debugging tool which allows you to run through your code step by step and look for errors, live syntax checking and auto complete of functions & variables. There are also some sample and instructional programs to help you to get started. What’s more, ROBOTC uses a C-programming language resembling what’s commonly used in industry so is a great transitional tool. What we really love about Vex is the sheer amount of free resources and support available. The Modkit and ROBOTC programming software is available for free when you buy a kit, as well as free video tutorials and PDF guides. Plus if you get stuck you can always contact support and speak with a genuine person from your country who actually knows about the products. On top of this there’s an active forum where you can ask questions, discuss things or just show off your designs! Vex are clearly a company that cares about their users and educating people in the field of robotics. 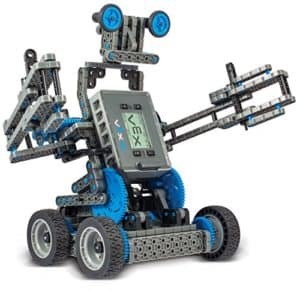 Whether you are a kid or an adult we think this is one of the best robotics kits out there! Best for Learning: Electrical Engineering, Coding. If you think Mindstorms and Vex are too high end, the Smart Video Car by SunFounder is a great budget option. You obviously shouldn’t expect the same build quality or versatility with this kit, but it’s still a nice bit of gear with some pretty awesome features. 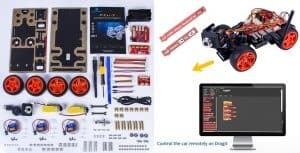 It comes with mostly everything you need to build your own remote control car, the coolest bit being the wide angle USB webcam that can live stream videos or images to your computer, smartphone or tablet! However, if you don’t own them already you will need to purchase some rechargeable lithium ion batteries and a Rasberry Pi – a tiny open source computer. We recommend the Pi 3 Model B as it has a powerful processor and built in WIFI/bluetooth connectivity. It is also recommended to buy a PH00 phillips head screwdriver for the M1.25 screws and a pair of needle nose pliers for when space is to too tight for the wrench. This is not essential but will make things easier. SunFounder provide a manual to guide you through the assembly, although we recommend also using the additional video tutorials on YouTube. There’s also the forum if you get really stuck! Putting the car together is fiddly but there is no soldering involved when assembling the circuit board as the wiring simply slots together, which allows room for error. They also provide 2 spares for every screw and nut which is a nice touch – there’s nothing worse than losing those essential bits! Please note it is strongly advised that you set up your Raspberry Pi & software up to the calibration stage before building the vehicle. This is because the HDMI port becomes blocked off once the car is assembled and you have to unscrew the circuit boards to access it. You can find a video tutorial on the software installation here. Unfortunately for SunFounder, this small mistake seems to be the source of quite a few of their unhappy customers. Control of the car and camera can be done in one of two ways. Firstly with the user interface which runs in a browser so it can be controlled remotely with any device that supports this. The range is equal to the reach of your WIFI, but technically it would be possible to install a 3G dongle and sim card for unlimited range! The second option is to program functions in with either Python – a dynamic and widely used language, or Dragit – a graphical, drag-and-drop programming interface developed by SunFounder. Our criticisms of this particular kit mainly relate to the poor quality in a couple of areas. Firstly, the screws provided are pretty weak and some will likely break during assembly. Rather than providing 2 spares for each it would have been better to just provide one decent set of screws! You may even want to replace them with better quality ones from the outset. Secondly, the servo motors are not great quality and they can lack the precision for the car to make accurate turns or drive consistently in a straight line. Again, you could replace these if you have the technical capability. If this is the case you may also enjoy modifying your vehicle further with this modular sensor kit. Despite these criticisms, this is still a great little kit for the Raspberry Pi and provides a good introduction to the field. This is a robotics kit for adults which serves primarily as a learning tool, not as an RC toy. A lot of time and research goes into recommending what we think are some of the best kits, but also the most suitable to your particular needs and interests. So we hope you’ve found this review useful! If you are more interested in the coding aspect, you may find our review of the best coding & programming interesting – be sure to check out Cozmo! Otherwise, check out our general list of STEM toys for adults. As always thanks for reading! Anki Cozmo vs Vector – What’s the Difference Between the Robots? STEM Toy Expert writes detailed recommendations & reviews on the best Science, Technology, Engineering & Math (STEM) toys. From babies to adults, from robotics to biology, we give advice on educational toys for a wide range of purposes and audiences. The toys and kits featured on our site are only our recommendation of what we think are the best out there, it is not an ultimatum! What’s best for your needs may differ from our suggestions. stemtoyexpert.com is a participant in the Amazon Services LLC Associates Program, an affiliate advertising program designed to provide a means for sites to earn advertising fees by advertising and linking to Amazon.com. We thoroughly research all the products we recommend. Buying products via our website helps to support our work and ensure we can keep providing information to our audience. Have a question? Get in touch below. STEMToyExpert 2018. All rights reserved.